Everyone is getting into the Christmas spirit, with less than a week to go before the big day and the inevitable over eating that it always entails. 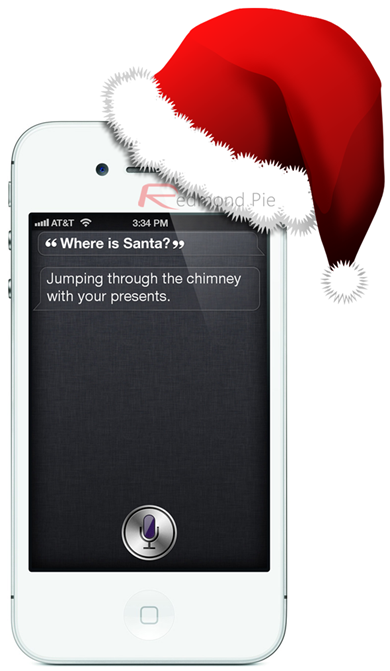 Even Apple is joining in with the festive fun this year, all in the name of helping to spread the word about just how awesome the iPhone 4S’ Siri is, and they have enlisted Santa Claus himself to help drive the point home. In a new iPhone 4S ad that Apple has just begun airing, Santa is seen using Siri to help him get through his busiest night of the year, Christmas Eve night. It’s all so dramatic! Siri can help anyone get through a busy day… Or night. Everyone’s favorite mince pie muncher is seen using Siri on iPhone 4S to check the route to a delivery destination as well as to read an iMessage from his wife. Awwww! Siri is also used to help check Santa’s calendar for upcoming appointments, with the big man having a busy schedule ahead of him – 3.7 billion kids is a lot! One part of the ad shows Santa asking Siri to search for an email, too, which is one use for Siri that many will possibly forget exists. At least one of the Redmond Pie team had, at least! Apple has been using Siri to promote the iPhone 4S since its launch back in October, perhaps lending credence to the suspicion that Siri has not found its way to other iOS devices simply to help differentiate the iPhone 4S from older devices. Apple will be expecting bumper sales for its iPhone range this Christmas, with a cheap iPhone 4 and free iPhone 3GS also amongst its arsenal this holiday season. The iPhone 3GS is especially important part of Apple’s jigsaw this year, giving Apple a way to combat the umpteen free or extremely cheap Android phones that are flooding the lower end of the smartphone market. Be sure to check out the Santa iPhone 4S Siri advert (embedded below) and then come back to tell us that you don’t suddenly feel very Christmassy!